When kids struggle in school, parents want to get help for them. But how to find a tutor who can help their kids and not break the bank can be a problem. Dr. Linda tells you how to find a tutor and what to look out for so you aren’t paying too much while your kids still don’t get the help they need. Before you and your husband consider finding a tutor, have a meeting with your children’s teachers to discuss what’s happening. They may be able to provide some help or offer you other suggestions. Many times, meeting with the teacher one to one helps. On the other hand, sometimes one-on-one help from a teacher doesn’t help when a child has difficulty understanding what the teacher is teaching in class. The same instruction privately won’t help either. If you decide to hire tutors, you need to become an educated consumer. It’s easy to end up with the wrong tutor. For example, just because some tutors say they know algebra, doesn’t mean that they know how to teach the new Common Core algebra. Your daughter needs to understand algebra in the way it’s taught with Common Core. In other words, do your homework before you start paying for tutoring. Otherwise, your children may spend hours wasting their time, not learning what they need to learn, and you’ll waste your money. Look for professional tutors who understand child development, know their subject well and have experience. Don’t be fooled when you’re told that your child needs a certain number of hours of instruction. It’s not possible to predict how many hours of instruction a student will need. Ask prospective tutors how they will help your child. An experienced tutor will tell you it’s essential to find the cause of the problem. If a company does the testing, find out what tests they’re using. Then talk to your children’s teachers or other professionals who understand testing to be sure the company is addressing your children’s needs. Find a tutor who will work with you and your children’s teachers to create individual programs. Find a tutor who allows you to sit in during the sessions so that you can learn what you need to do to help your children. Get recommendations for tutors from family, friends, school counselors, pediatrician or other professionals your daughter and son are seeing. Look for tutors who don’t require a contract. You don’t want to pay for tutoring when your children have already learned what they needed. If you do your homework, you may not need to spend so much money on tutoring or take out unnecessary loans. And your children will have more free time. P.S. 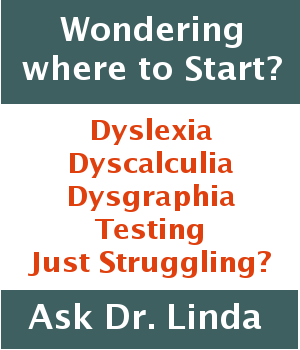 Dr. Linda and Strong Learning offer professional tutoring at all levels and in all subjects without contracts or a required number of hours. Children receive appropriate testing and tutoring based on their individual needs. For more information, call 845-628-7910 today.